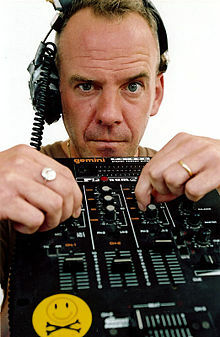 Norman Cook (born Quentin Leo Cook on 16 July 1963), known by his stage name Fatboy Slim, is an English musician, disc jockey, rapper, and record producer. He is known for songs like "Weapon of Choice", "The Rockafeller Skank", "Praise You", "Eat Sleep Rave Repeat", and "Right Here Right Now". Cook was born in Bromley, Kent. He was raised in Reigate, Surrey. He married Zoe Ball in 1999. The couple have a son and daughter. They separated in 2016. ↑ Matt Quinton; Mike Ridley (September 25, 2016). "Zoe Ball's dad blames trauma of mum leaving family for 'self-destruct mode' that caused Fatboy Slim split". The Sun. News Group Newspapers Limited. Retrieved January 30, 2017. This page was last changed on 30 January 2017, at 17:14.